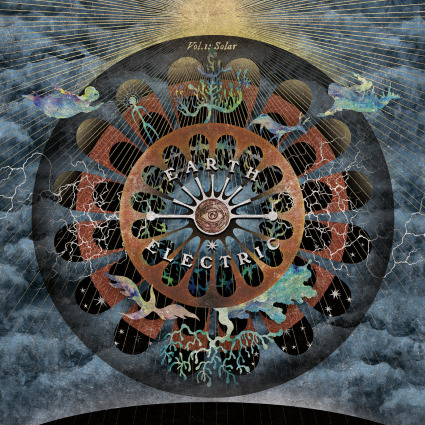 Review: "Earth Electric: Vol. 1: Solar" - Sea of Tranquility - The Web Destination for Progressive Music! Ever wonder what Ghost would sound like with a female vocalist? Well, look no further than Vol. 1: Solar, the debut album from Earth Electric, a band that features former Mayhem & Ava Inferi guitarist Rune Eriksen, ex-Moonspell & Ava Inferi vocalist Carmen Simoes, bassist Alexandre Ribiero, drummer Ricardo Martins, and studio keyboard player Dan Knight. Combining both modern & vintage heavy metal elements along with some touches of prog, electronica, and industrial, Earth Electric have a melodic yet spooky feel that's not far removed from the popular Swedish act I mentioned above, with tunes like "The Endless Road" and "Mountains & Conquerors (pt2)" containing some catchy hooks to go along with Simoes' ethereal vocals, hard hitting guitar riffs, and floating keyboards. Those 'whispered' vocal chants pop in and out of the bands music quite regularly, as on the heavy "Meditate Meditate" and the keyboard drenched prog/metal attack of "Set Sail (Towards The Sun)". In fact, the Hammond organ plays a key role on the album, saddled up alongside powerful riffs on the cracking "The Great Vast", grinding away on the Deep Purple-ish "Solar", and laying down a sultry base for plenty of soaring vocals and intricate guitar & synth lines on the engaging "Earthrise". Overall, Vol. 1: Solar is a very enjoyable debut from Earth Electric, it's 'closeness' in feel to what Ghost has been pumping out in recent years sure to draw some attention, yet once you start to listen more closely they have plenty of originality to offer. Eriksen is in fine form here, displaying a lot more chops than what we've heard from him in prior bands, and Simoes is indeed a powerful vocal talent. Those who gravitate towards the more occult & prog side of dark metal but also like some strong hooks would be well advised to check this one out.